At first glance, intuitive eating seems like it should be easy—we hear how it’s about letting go of diet and food rules, “eating whatever we want”, and how we’re all “born intuitive eaters”. So it’s understandably frustrating when you’re weeks, months, or even years into the “journey” and still feel like you don’t “get it”. Is Perfectionism Getting in the Way of Your Intuitive Eating? 1. What is Intuitive Eating Anyway? Part of what makes intuitive eating so hard to grasp is that unlike a diet, the end result can look different for everyone. While the 10 principles frame intuitive eating, there is flexibility and nuance in how they are interpreted for each individual. The “perfect intuitive eater” that I described above actually reflects a lot of common misconceptions that people have about what intuitive eating is. If you’ve been learning about intuitive eating through blogs, articles, podcasts, and social media, you’re probably not getting the full picture. It’s not perfect, (though I’ve heard a 25th anniversary edition is coming down the pipeline!) but read the book. Do the workbook. (Amazon Associates links) If it’s available to you, work with a Certified Intuitive Eating Counselor like myself (I also work virtually!) or someone locally. We’ve been conditioned since our schoolyard days that it’s not enough to simply learn something; we should also master it and/or get something out of it. Whether it’s good grades, “perfect intuitive eater,” or some other end goal, it takes the curiosity out of learning and turns it into a project. I share this analogy in The Mindful Eating Workbook and my Intro to Meditation & Mindful Eating mini-course: what would it be like to approach learning as though you were a child, alien, or scientist? (Or child alien scientist?) Instead of thinking, “I need to master X so that I can get Y,” you approached it with the attitude of, “What happens if I do X?” And instead of judging, blaming or admonishing yourself if X doesn’t work out, perhaps acknowledging the frustration or discomfort, before moving on to something else. I touched briefly on the importance of self-compassion in my previous post, but it bears repeating here. As you’ve probably gathered by now, intuitive eating can be a s-l-o-w process, especially compared to starting a new diet. With dieting, all you have to do is know and follow the rules to “get it,” whereas there are more nuances to intuitive eating. Additionally, you’re constantly fighting messages from friends, family, loved ones, health professionals, and society in general that tell you that you should be dieting and trying to lose weight. 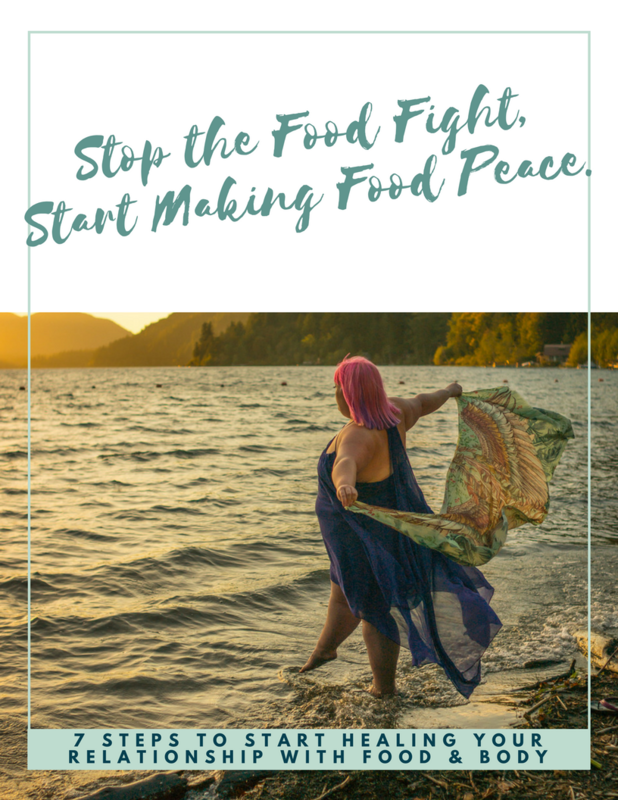 Remember that you are trying to undo years (possibly a lifetime) of diets, food rules, and body hatred with this work, and the stream of diet talk sadly doesn’t stop in its tracks when you decide to pursue intuitive eating. This is hard work, and you are so brave and so strong for deciding to do this. You’ve got this. Wherever you’re at when it comes to eating intuitively, I hope you can find the resources and support that you need to step away from diet culture, and live your life to its full potential. Do you consider yourself an “intuitive eater”? Why or why not? What are some resources and supports that have been helpful for you? Please share in the comments below! Sign up to become an Insider! Stay on top of the latest nutrition news and trends, and get practical tips and delicious recipes every week.